In 2016, the US Department of Energy (DOE) Pacific Northwest National Laboratory(PNNL), announced its intention to develop lithium-metal batteries with a specific energy of 500 Wh/kg, compared to the 170-200 Wh/kg per kilogram in today’s typical electric vehicle (EV) battery. 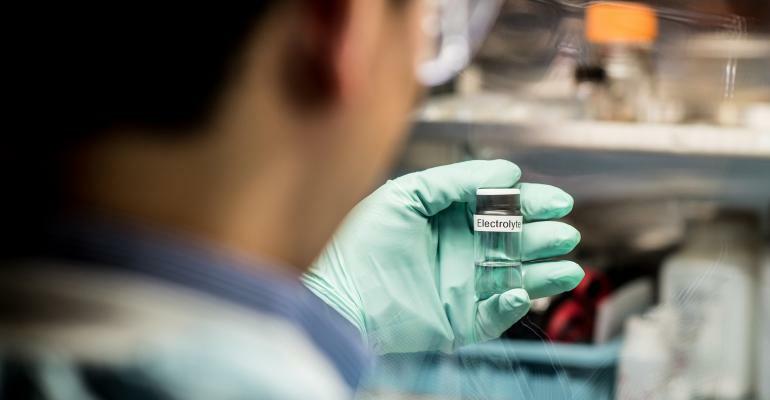 As part of its efforts, the Battery500 consortium announced the “Seedling” program which involves new, potentially risky battery technologies that could pay off big and grow into significant energy storage solutions. 15 Phase I projects, receiving almost $5.7 million in funding, were awarded. Of these 15, the University of Maryland (UMD) received three. Promising Phase I awards were to be competitively down-selected at the end of 18 months for a second phase of research funding. During the initial phase, UMD was the only institution to receive multiple awards. Now 18 months later, twoof these initial awards have been tapped by DOE for a phase II application. The first, “3D Printed, Low Tortuosity Garnet Framework for Beyond 500 Wh/kg Batteries” by Dr. Eric Wachsman, Director of the Maryland Energy Innovation Institute (MEI2) and William L. Crentz Centennial Chair in Energy Research, and Dr. Liangbing Hu, UMD Associate Professor in Materials Science and Engineering (MSE). The 3D printing method enables ordered low tortuosity and higher porosity (~85%) garnet structures, such as columns, stacked arrays, or more complex patterns. Thus, say Wachsman and Hu, the resulting enhanced charge transport and ease of electrode infiltration will allow a dramatic increase in electrode thickness with an optimized structure and obtain even higher energy density far exceeding 500 Wh/kg. The second UMD award to advance is “Advanced Electrolyte Supporting 500 Wh/kg Li-C/NMC Batteries” from Dr. Chunsheng Wang, UMD Wright Distinguished Chair in Chemical and Biomolecular Engineering. The objective of Wang’s project is to research, develop, and demonstrate a Bi@graphite/NMC811 and Bi@graphite/LiNiO2battery capable of achieving an energy density ≥ 500 Wh/Kg while achieving a life of ≥ 1,000 cycles using super fluorinated electrolyte. The Maryland Energy Innovation Institutebrings together science, industry, government and economic leaders to develop solutions to global and local energy problems (i.e. cleaner and renewable energy solutions; more efficient use and storage of energy) and assist the transfer of knowledge and resources to the public in addition to transitioning the research into marketable products and services through locally based entrepreneurial ventures.